Home » Category "Season 13"
Are you ready for some filler? How about some specious boxing analogies? Let’s roll! The methodology for the finals model is described here (though some modifications have been made to replace Dialidol with MJsBigBlog’s poll). The model is 87% accurate on ranking within a margin of error of +/- 3%. Probabilities being what they are, somebody with a not-safe probability of just 0.25 will be in the bottom 3 one out of four times. Please do not comment that the numbers are wrong. 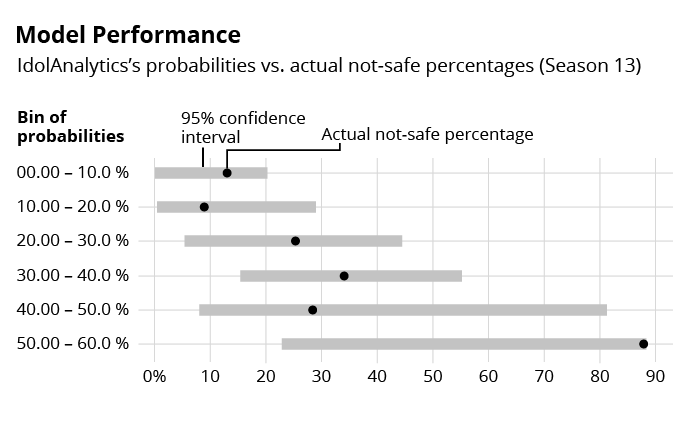 They are probabilities, not certainties or even claims. Do not gamble based on these numbers. Name in green is most likely to be safe. Name in red is considered most at risk for being eliminated. The most probable elimination is Caleb. However, no result would be shocking. The contest is far from a runaway for Jena Irene, but it certainly doesn’t look bad for her. Names in green are most likely to be safe. Names in red are considered most at risk for being eliminated. Names in yellow are undecided. The most probable elimination is Caleb. However, anybody being eliminated would not be shocking. Caleb had a rough night, having contracted bronchitis, and resulting in a very low (for him) average performance approval rating, and also giving him the lowest approval rating for a song, a 12/100 for Demons (which the judges said was good???). As least popular on Votefair, and slightly favored on MjsBigBlog to be eliminated, he is the best bet. Alex is ahead of Caleb by about 10 percentage points. He had the highest approval rating average of the night, and is slightly more popular on Votefair. Jena is running significantly ahead of both men on MJs and VF, and slightly trails Alex on WNTS, though she did have the highest rating of the night on her reprise of Creep. I will update if the numbers change significantly. The Top 3, historically, has not been very hard to call. Huge surprises, such as Melinda Doolittle’s elimination, have happened, but more often we see contestants like Nikki McKibbon, Jasmine Trias, and Syesha Mercado, who were overdue for elimination. There does not appear to be any reason to think there is a gender bias in this round, although the sample set is only 9 (four Top 3s were monogendered). I would say of all the years, this is one of the closest, with Elliott Yamin vs Katharine McPhee being the hardest of all to call. Below is the updated performance for the season. All ranges are within tolerance, though 50-60% is barely so (it tends to understate how vulnerable those people are).